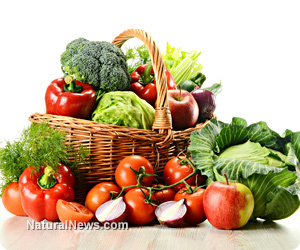 (NaturalNews) A new study suggests that eating seven or more portions of fruit and veggies a day is significantly healthier than the five a day currently recommended, and may protect against disease. Following recommendations from the World Health Organization, in 2003 the UK launched the "5-a-day" fruit and vegetable campaign. One portion is equivalent to roughly 80 grams of fruit or vegetables. However, a new study published in the latest edition of the Journal of Epidemiology & Community Health suggests that five a day may not be enough. The study looked at 65,226 men and women above the age of 35 in the UK, analyzing dietary patterns from annual surveys between 2001 and 2008. The researchers examined the associations between fruit and vegetable consumption and general mortality rates, as well as death from heart disease, cancer and stroke. The results of the study indicated that the more fruit and vegetables people ate, the less likely they were to die prematurely, regardless of their age. Seven portions a day also significantly cut the risk of dying from cancer and heart disease. Fresh vegetables had the most significant effect on lowering mortality risks, followed by salads, fruit and dried fruit. These plant foods are rich in fiber, antioxidants and important micronutrients that are involved in repairing damaged cells and fighting disease-causing free radicals. Fruit juice on the other hand showed no signs of any health benefits. Canned fruit even seemed to increase mortality risks, possibly due to the storage in sugary syrups or tin cans. Some have argued that the results need to be taken with a pinch of salt. Although taken into account in the study, some argue that lifestyle factors, such as exercise habits and not smoking, may have also contributed toward the drop in mortality, not just the consumption of fruits and veggies. Whilst these lifestyle factors can definitely also have an impact, common sense tells us that eating more fruits and vegetables is probably the right way to go for lasting health. Lead researcher Dr. Oyinlola Oyebode suggests that government recommendations should be reviewed, but some have already resisted, claiming that most people fail to reach the current five a day recommendations, let alone seven. What do you think? Should the policy remain the same, despite the new evidence? Should the UK perhaps adopt the Australian recommendations of five vegetables and two fruits, or are the guidelines fine as they are? Luke Jones is the creator of Health Room, the blog dedicated to investigating and sharing ideas in plant based nutrition, moving freely, living mindfully and existing sustainably. Luke is a graduate of Imperial College London, a martial artist, and plant based nutritionist. He enjoys exploring natural movement and eating a whole-food, plant based diet. He also loves seeing other people chase their dreams, and realise their health potential.